I hope, everything goes by plan. This has been my 5th or 6th trip to Shirdi, i didn't remember exactly. 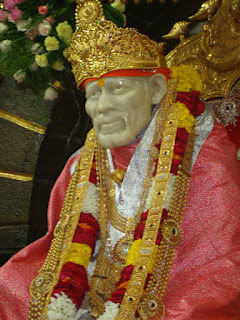 Iam fortunate enough to visit Shirdi around early 2000's. It was not at all like this earlier. Not much crowd, no good provisions for stay and no Andhra hotels. But, darshan used to be very peaceful and pleasant experience. It was like a normal temple, only crowded during aarti times 4 times a day. No queue at all except for aarti times. There used to be only one train per week from Hyderabad to Shirdi. So, we used to go through Hyderabad whenever we travel to Shirdi. Roaming in Hyderabad till evening, to pass time before catching the train was a very good memory. Visiting Birla mandir was always on the list! We used to get down in Manmad through Manmad express and go by bus to Shirdi from there. Later, we found that Nagarsol is the nearest station and from next trip onwards, we used to go through Nagarsol. Bhakta Nivas is the complex with all amenities like food and stay provided by Shirdi sai sansthan at minimal rates. Now, they have built few more complexes for devotees like 'Dwarawati'. Ok then, see you all after the trip..